This customer was looking to get away from the shore where it was deep enough to moor a boat. This 40×8′ floating dock was launched in two separate sections and then bolted together on the water. In addition, a 12×4′ walkway is hinged to the concrete seawall. The dock end of the walkway has a single barrel under it that hangs above the water when the walkway is resting on the dock. 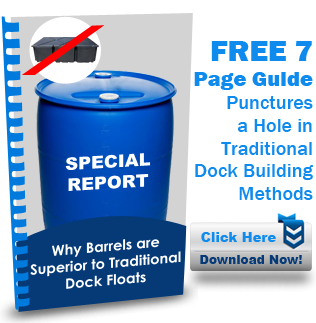 But if the dock is removed, the walkway drops to the water and floats on the barrel. If the neighbors are having a party, this dock can be easily floated over to give the guests more space to hangout on the water.